Bill Haltom is a father, husband, lawyer and award-winning writer. He is the author of six books and has been a newspaper and magazine humor columnist for over 25 years. In his latest book, Bill has teamed up with a brilliant young writer—Amanda Swanson—to tell the story of a game-changing lawsuit, Victoria Cape v. the Tennessee Secondary School Athletic Association. Filed and tried in the 1970s, this landmark case under Title IX challenged the archaic rules that once confined female basketball players to a half-court game. The star witness at the trial was a young Pat Summitt who would go on to be the greatest women’s basketball coach in the history of the game. Bill and Amanda tell the story of how Pat, a brave young high school player, and their lawyers scored an historic victory for female athletes, not on a basketball court, but in a courtroom! 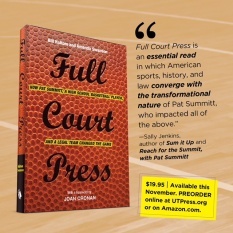 Click here to listen to Bill and Amanda discuss Full Court Press on WUOT's All Things Considered. A BASEBALL SHOT CLOCK? SAY IT AIN'T SO! JUPITER, FLORIDA - I am sitting in one of my favorite places on Earth, Roger Dean Stadium, winter home of my beloved St. Louis Cardinals. It is the first day of spring training season (the Grapefruit League), and I am blessed to be in the ball park to watch my Cardinals take on the Miami Marlins. It is a glorious sunny day with the termperature in the 70s! Over the years I have heard many sermons about love. But last Sunday morning I heard a sermon not about love, but about like. Last Saturday morning I took a long walk through the streets of Memphis. 13.1 miles to be exact. I was not alone. I was accompanied by 26,000 of my closest friends. Well, that’s not totally correct. At the starting line, I was with tens of thousands of friends, and they quickly left me behind. Bill Haltom’s definitive guide to the quintessential Southern fabric covers all things seersucker. From the origins and history of the seersucker suit to the many different ways, places, and reasons people wear it, Milk & Sugar has it all. A tribute to the late Senator Howard Baker, a great leader whose civility brought adversaries together to find solutions to our nation's problems. In the current political environment, civility is going the way of the dinosaur, as many of our leaders argue for the sake of argument and accuse for the sake of advantage. Consequently, public governance has become dysfunctional. Senator Baker's civil life remains a model of what our leaders could accomplish by always reminding themselves that the other fellow may be right! Bill has delivered three commencement addresses and has been the featured speaker at numerous conventions, banquets, and seminars. Bill joins host Pat Nolan to discuss his book The Other Fellow May Be Right: The Civility of Howard Baker.